The strategic direction statement for the Administrative Appeals Tribunal (AAT) can be found in the 2016–17 Portfolio Budget Statements. There has been no change to the AAT’s strategic direction as a result of Additional Estimates. 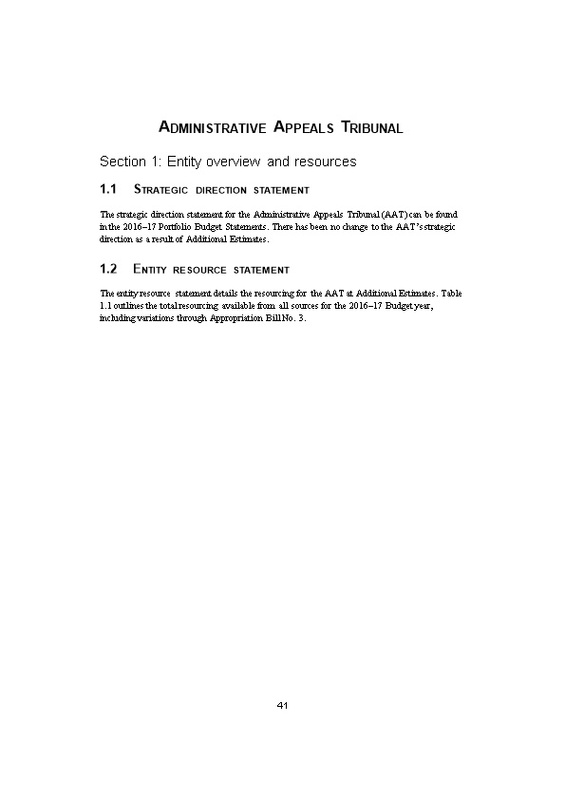 The entity resource statement details the resourcing for the AAT at Additional Estimates. Table 1.1 outlines the total resourcing available from all sources for the 2016–17 Budget year, including variations through Appropriation Bill No.3. Prepared on a resourcing (appropriations available) basis. Note: All figures are GST exclusive and may not match the figures in the cash flow statement. (a)Estimated balance carried forward from previous year for annual appropriations. The 2015–16 amount relates to AAT, Migration Review Tribunal and Refuge Review Tribunal unspent appropriations. (b) Appropriation Act (No. 1) 2016–17 and Appropriation Bill (No. 3) 2016–17. (c) Estimated retained revenue receipts under section 74 of the Public Governance, Performance and Accountability Act 2013 (PGPA Act). (d) Departmental capital budgets are not separately identified in Appropriation Act (No.1) and form part of ordinary annual services items. See Table 3.5 for further details. For accounting purposes, this amount is designated as ‘contributions by owners’. (e) Appropriation Act (No. 2) 2016–17. (f) Repayments not provided for under any other appropriation under section 77 of the PGPA Act. (g) Average staffing level numbers exclude tribunal members. Table 1.2 summarises new government measures taken since the 2016–17 Budget. Prepared on a Government Finance Statistics (fiscal) basis. (a) The lead entity for this measure is the Department of Human Services. The full measure description and package details appear in the 2016–17 Mid-Year Economic and Fiscal Outlook under the Social Services portfolio. (b) The lead entity for this measure is the Department of Social Services. The full measure description and package details appear in the 2016–17 Mid-Year Economic and Fiscal Outlook under the Social Services portfolio. (c) This is a cross-portfolio measure that was published in the 2016–17 Budget. The lead entity is the Department of Finance. Table 1.3 shows changes to the resourcing for the AAT at Additional Estimates, by outcome. The table details the additional estimates resulting from new measures and other variations since the 2016–17 Budget in Appropriation Bill No.3. Table 1.4 details the additional estimates sought for the AAT through Appropriation Bill No.3. The AAT has no additional estimates through Appropriation Bill No.4. Note: 2015–16 available appropriation is included to allow a comparison of this year’s appropriation with what was made available for use in the previous year. Table 2.1 shows how much the AAT intends to spend (on an accrual basis) on achieving Outcome 1, broken down by program and by administered and departmental funding sources. (a) Special appropriations consist of refunds of fees paid under section 77 of the Public Governance, Performance and Accountability Act 2013 (PGPA Act). (b) Estimated retained revenue receipts under section 74 of the PGPA Act. This includes write-down and impairment of assets. (c) Expenses not requiring appropriation in the budget year are made up of depreciation and amortisation expenses, make-good expenses, Australian National Audit Office audit fees, notional contributions under the Judges’ Pension Scheme and a portion of the AAT’s occupancy cost of the Commonwealth Law Courts buildings in Brisbane and Hobart. (d) Average staffing level numbers exclude tribunal members. There are no changes to the AAT’s performance information for Outcome 1 reported in the 2016–17 Portfolio Budget Statements. The AAT has no special accounts. Changes to the departmental budgeted financial statements since the 2016–17 Portfolio Budget Statements include funding for new measures and indexation changes across the forward years. DCB = departmental capital budget. (a) Includes both current and prior year Act 2 and Bills 4 and 6 appropriations and special capital appropriations. (b) Does not include annual finance lease costs. Includes purchases from current and previous years’ DCBs. (c) The 2015–16 actual amountincludes property fit-outs funded by landlord incentives. (a) ‘Appropriation equity’ refers to equity injections or administered assets and liabilities appropriations provided through Appropriation Act (No. 2) 2016–17 and Appropriation Bill (No. 4) 2016–17.